The best variety for indoor winter blooms. The cultivar 'Goodwin Crek Grey' is a hybrid of French lavender that we discovered about 20 years ago. 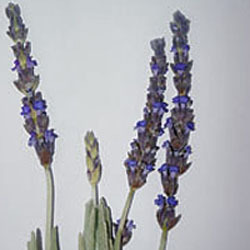 It is similar to 2 other French lavender hybrids, Lavandula x heterophyla (from the early 1800's) and Lavandula x allardii (from the 1890's). All 3 bloom throughout the summer and will even bloom in the winter in mild climates. 'Goodwin Creek Grey' and French lavender are the best choices for a winter blooming indoor lavender. They need about 5 hours of sunlight each day for winter bloom; a south facing window, sun room or sun porch should provide enough light. It looks great in the landscape, large containers or trained as topiaries. The silvery toothed foliage is very attractive and the corollas are deep purple. Categories: all potted plants, deer resistant, indoor lavender collection, lavender plant collection, lavender plants, lavenders for heat & humidity, pollinator plants, More..